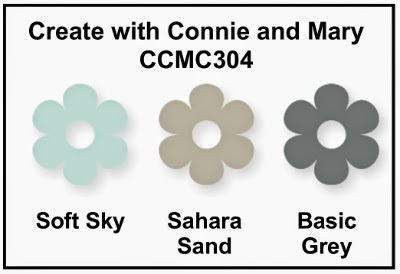 This week we have a color challenge at Create with Connie and Mary; I wasn't sure at first what I would do with this color combination but really fell for it after I started to work with it! These are soft and lovely colors together: Soft Sky, Sahara Sand and Basic Gray! I used my Gifts of Kindness set for the first time, stamping the image with Basic Gray onto Soft Sky cardstock then embossing it with the Polka Dot TIEF. I stamped the flowers a second time on scrap cardstock then punched out two flowers using the flower in the new Itty Bitty Accents Punch Pack and added them to the center of the largest two flowers. I embossed a 1-1/2" x 4-7/8" strip of Sahara Sand cardstock with the Scallops TIEF, tied on a bow then adhered it to the card. A little floral butterfly was added to the scallop strip and small Pearls were added to the body as well as the floral image. The sentiment from Friendly Phrases was stamped on a banner with a smaller Basic Gray banner behind. I was very pleased with the way it turned out and really like these colors together! 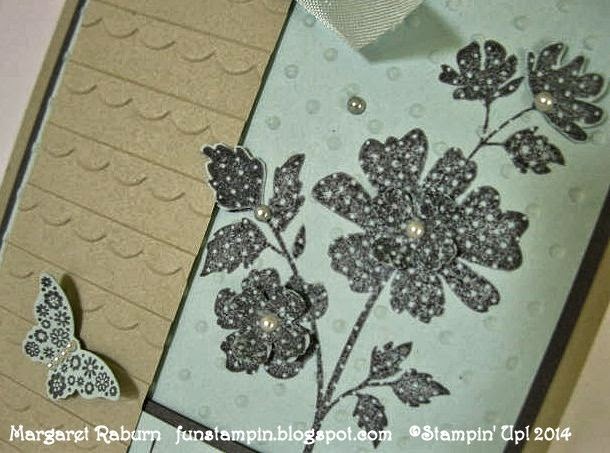 Accessories: Embossing Folders: Scallops, Polka Dot; Soft Sky Seam Binding Ribbon, Basic Pearls, Glue Dots, Bitty Butterfly Punch, Itty Bitty Accents Punch Pack. 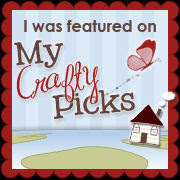 Be sure to check out all the other beautiful creations by the Challenge Team at the Create with Connie and Mary website, then take the challenge yourself!! All the guidelines are on the website; we can't wait to see what YOU do with it!! I love how you stamped first and then embossed. And I really like how you placed 2 embossed panels side by side. Such a lovely card, Margaret! So well thought out and so beautiful. 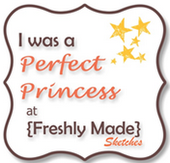 I like how you added the little flowers from the bitty shapes punch. The butterfly is gorgeous! Thanks for the inspiration! So many beautiful details on your card! Love this stamp set! 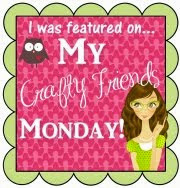 Great texture, too! Love this! 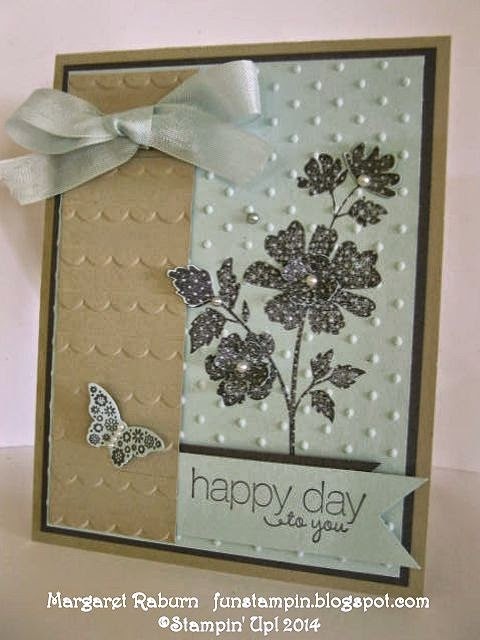 Love the way you've managed to mix the textures and pattern of the flower stamp to such great effect here. A really pretty card. Beauful card, Margaret. 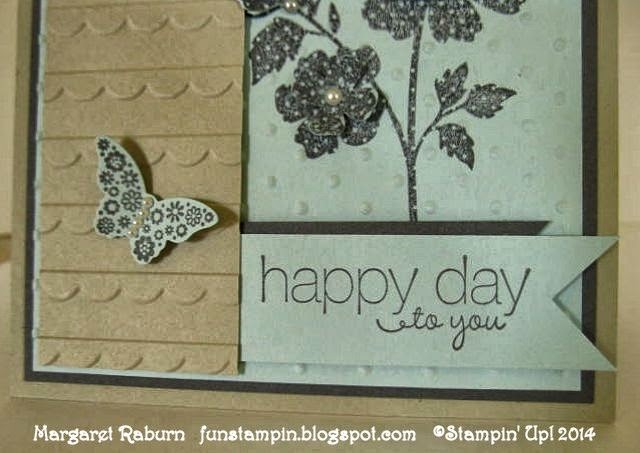 Love the color combo and the stamping with embossing. .
Just lovely! Love all the texture and the soft colors. Who would have thought that the flower image would look good stamped in gray...but it does look great! Really neat effect! Love how you made the masculine colors look feminine with the touch of scallops and polka dots!Such a sweet card! So pretty...love this panels and texture on here. Great job with the color challenge this week! Beautiful!!! I love the flowers but my favorite is the scalloped embossed panel, such a great design idea!